I wanted to make this list of "Personal lessons learned" through Kickstarter, so that you may navigate the Kickstarter sphere - when you're going to do your own crowdfunding of a board game. This list will include pointers, short "how to" descriptions and general thoughts on the topic. These have been great inspiration sources for me! Stretch goals are a very nice way of upgrading components and adding more content to your game. But be careful not to put backers in a dilemma, where they have to decide whether they want your game without stretch goals or not. 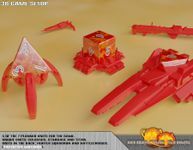 On my first Kickstarter campaign, I put some really awesome plastic pieces as stretch goals. Backers really wanted these pieces, but they weren't sure I would make it to the stretch goal target, which meant they were forced to decide. This made many people cancel there pledge, because they were nervous, whether or not I was going to make it. These were too good to have as a "what if"-scenario, these needed to be in the base game. I included the cool Dieships and minis from the very beginning, meaning everyone knows what they are going to get if we fund. Go check out my newest campaign and hold it up against my old campaign. I'm sure you'll see the difference. Asking backers for help is an essential part of any Kickstarter success, nobody will ever deny that. But how you go about this is also important to get right. In my first campaign, I did indeed ask my backers for help in spreading the word. It helped, and I'm very thankful for all of my backers that gave me a hand in this endeavor. But I didn't create any "real" incentive to helping me (besides the more obvious fact of getting funded). This time around I also asked my backers, but with a twist. I wanted to give something in return that they could enjoy. So I made some viral goals for my Kickstarter campaign. - If we get X fans on BGG, there will be 2 sweet digital wallpapers. - If we get X fans on Facebook, we'll do some blank PDFs for backers to print their own stuff. Go to the Burning Suns page and see how many cool fans it has!